The alarm clock rings. You hit the snooze button, then you over sleep by 10 minutes. Oops! There goes breakfast. It doesn’t matter, you think to yourself, because you ‘over-ate’ last night so you’ll begin the day eating only air for breakfast and coffee for morning tea. Then, brain fog sets in. By midday, you’re so cranky and irritated that you wish you’d stayed home (and so do your co-workers!). In your brain-fog state, you grab something quick and easy to eat, regardless of the nutrient value. This binge then makes you think that you’ll begin a healthy eating plan tomorrow. Sound familiar? If you care about your health, weight, mood and energy then you should begin your day with breakfast. If you’re trying to keep your energy up and your mental performance levels high during the day, then skimping on breakfast will work against you. When you wake up, you’ve just gone eight hours without food, your body is craving nourishment, and your brain needs glucose to function at its best. Skipping breakfast sets you up for disaster in a number of different ways, but research shows that as many as 40 per cent of people skip breakfast anyway, and many kids leave for school without it. People who skip breakfast are more than four times as likely to be obese than people who eat something in the morning. That’s right, skipping breakfast makes you bigger! Numerous studies over the years have shown that skipping breakfast impacts the behaviour and mental performance of school kids. Students who eat breakfast have better memory and higher maths and reading grades. In contrast, kids who go to school without breakfast have a higher number of behavioural problems, such as difficulty with teachers and friends, and this leads to a vicious cycle of poor self-esteem. People who eat breakfast are far more likely to get a healthy intake of vitamins and minerals than those who don’t. Higher protein breakfasts translate into a more sustained level of energy throughout the morning. Protein fills you up longer than carbs, so you’re less likely to have mid-morning cravings. You’re also less likely to over-eat at lunch or to get so hungry that you’ll grab whatever junk food you can get your hands on. Higher protein at breakfast increases metabolism, helping you maintain a healthy weight. In one study, a high-protein breakfast increased the metabolism of healthy young women by 100 per cent! Eggs: Eggs are loaded with protein and other nutrients such as phosphatidyl choline for the brain and heart. Scramble some eggs in coconut oil with spinach seasoned with lemon pepper and turmeric (one of nature’s great anti-inflammatories). You’ll have a breakfast loaded with protein and nutrients. Plain Greek yoghurt: This thick yoghurt contains active cultures, and it’s higher in protein than traditional yoghurt. Try a cup with nuts, seeds or berries for extra nutrition. Nut butter sandwich: Buy a dark grain bread and spread some natural peanut or almond butter on a slice, fold it in half, and you have an easy, no-cook breakfast. It goes great with some hot green tea. If you don’t like nuts, try some avocado mashed with lime and sea salt as your spread. Whey protein shake: If you can’t imagine eating a protein source for breakfast that isn’t bacon or sausage, try some powdered whey protein for your protein source. It’s easy, inexpensive and versatile; just be sure to buy pure whey protein without any added sugars or artificial sweeteners. Visit A Healthy View website for recommended brands. 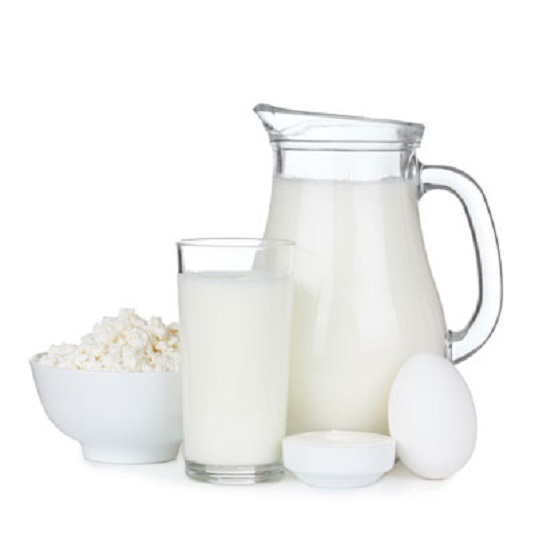 You can mix whey powder in water, milk or juice, or you can sprinkle some on your cereal. You can make a smoothie by adding frozen berries or half of a banana, or you can try powdered whey in coconut milk or coconut water, almond milk or rice milk. Adding a splash of flax oil to the shake adds essential fats and helps the smoothie sustain you a little longer. Experiment and see what works for you.